Fertilising is an important part to get right, first check by lifting the corner of a couple of rolls to see if your turf has developed a root system, then apply only small amounts of fertiliser (Baileys Nu Lawn) every 6 weeks until the turf is established. The use of large amounts of fertiliser at once will only result in nutrient leaching and excessive growth. Sir Walter Premium Turf requires less fertiliser than couch grass varieties to maintain a beautiful colour, especially less nitrogen. Newly planted lawn comes without a root system and needs a balanced starter food source.Sir Walter has developed a product called Sir Launcher with additional trace elements and water crystals which can be applied when the turf is being layed. Fertiliser should be spread at a rate of no more than 2kg (a standard 2 litre ice cream container) per 100m² per application. Sir Walter should only be fertilised when a loss of colour or vitality is noticeable. The most accurate way to spread fertiliser is with a “Scotts” Handie Green Spreader. These are available from Lawn Doctor, along with the handy pails of specialised buffalo fertiliser. NOTE: The use of large amounts of fertiliser at once will only result in nutrient leaching, excessive growth and is a waste of money. The more established your turf the less water you need to apply. This means that over the first couple of months you will gradually reduce both the amount of times you water and how long you water. Lawns in Perth need to get 30-40mm per week when temps are reaching over 34 degrees and the time taken to put this amount of water out varies between sprinkler type. This means if you have Rotary type sprinklers that are designed for low pressure and windy areas you may need to run your sprinklers for 60 to 90 minutes per station to put out this amount of water. A simple way to check this is to spread some pressure pack caps (if you can’t get catch cups) randomly over your lawn. Time how long it takes to catch e.g. 15mm of water. Once this is known you can then set your controller to run so as to deliver the correct amount of water to your lawn. For instance 10mm caught in 20 minutes, = 15mm in 30 minutes, = 2x 30 minute applications per station, per week, to receive 30mm of water. Being aware of mains pressure changes this test should be done at around the time you would normally be watering. If the amount of water in the cups varies too much an audit of the system should take place so as to fix discrepancies. Lawn Doctor can assist with an audit on your system. 1. A faulty reticulation system, with blocked and or misaligned sprinklers or low pressure being the most common problems. In new sub divisions the amount of pressure in your system can also change depending on how many new houses are being added to the same mains. Also, differant sprinkler types need to be ran for differant times, for example rotating or gear driven sprinklers need 45 minutes to put out 15mls, while a conventional pop up system may only need 10 minutes. Note: The poor humble lawn beetle or black beetle is often blamed for these conditions. To check if in the unlikely circumstance you do have an infestation you can stick your hose into the lawn and flood the area of about a metre square. If you get more than 20 adult beetles or grubs floating to the top then yes you do have an infestation and a substance can be used to eradicate the problem. Usually though you won’t and any less than the above amount can actually be beneficial to your lawn as they burrow through the soil, acting as an organic aerator. Bi Agra is a new innovation in the fight against hydrophobic soils. All other wetting agents work by getting your soil to accept the water. Bi Agra is a revolutionary new product as it not only gets your soil to accept the water, it also helps your soil to hold the water for longer, thus giving a dual action effect that has been tested by the University of WA. It should be applied at the start of spring as it is easier to keep soil moist then to try and re wet it once it has dried out. We also recommend it be re applied in December when the really hot weather starts and again in February when the turf is really struggling. Once water is penetrating into the soil you need to apply a fertiliser with a small amount of phosphorus like Knights Coastal Special Mix to get the roots stronger. We also have our own bulk amounts of commercial grade wetting agent, Knights EZY Wet, available. Mowing should commence once the turf has established a root system and is held to the soil. Don’t leave it too long before you mow for the first time, as you will only scalp the turf. Establishment times can vary from 4 – 6 weeks in winter, to 2-3 weeks in summer. Your choice of cutting height can enhance the positive growing characteristics, or on the other hand, diminish the appearance and resilience of the turf. Rule of thumb is to only remove one third of leaf at any one time. For mowing Buffalo, Lawn Doctor Turf Farms recommend a cutting height of 20-25mm in summer, mowing every 2 weeks and 25-30mm in winter, mowing every 4 weeks. If you have planted the turf in an area which has considerable shade cover then your mowing height will need to be quite high! Lawn retains that luxurious look and feel which not only looks good but feels good at the same time. More frequent cutting allows for only one third of the leaf to be removed, which assists the plant to retain the majority of water and nutrient stored in its leaves, thus enabling the turf to survive quite happily on just two waterings per week. A higher cut ensures that the turf is not scalped, which in turn protects the stems from direct sunlight and heat stress. When stems are scalped, new ones grow to cover and protect the damaged ones. This has been a major cause for thatching in the past. Allowing the leaf to remain longer also promotes a deeper root system. Scientific research shows a direct correlation between the two. This is being promoted worldwide to conserve water. In cooler months, it is critical to leave as much of the leaf intact as possible after mowing, as the reduced sunlight and lower temperatures cause the photosynthesis process to slow down, therefore restricting the plant’s ability to produce food. Once too much leaf has been removed, the turf will struggle to recover and will simply tend to go dormant until the weather warms up again. In this weakened state, the turf will damage easily, which in turn will allow unwanted weeds to establish themselves. 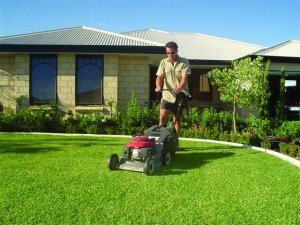 For Lawn Mowing contractors, adjusting the cutting height of conventional mowers can be a hassle, therefore it is necessary to overcome this problem by having a wind up/down height adjuster fitted to the mower or by using a different mower for the buffalo.